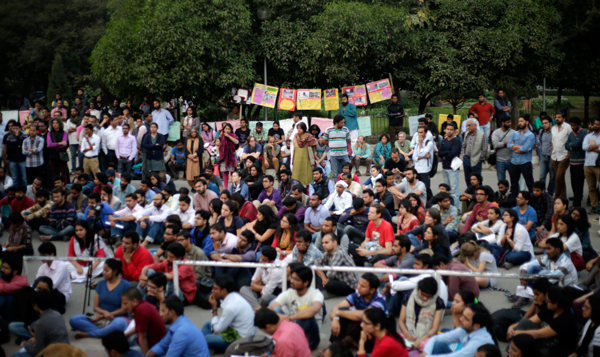 "The right to dissent couldn't have been more important when we are being engulfed by a 'cacophony of nationalism'." 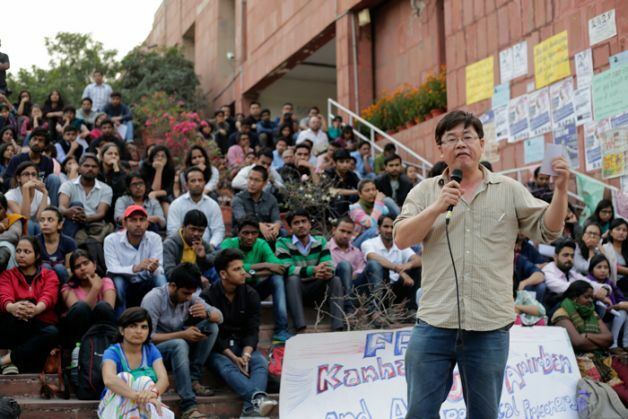 Addressing a packed gathering at JNU's Administrative Block, legal scholar and researcher Lawrence Liang shouted out this statement, and exhorted the audience to ponder upon the sedition law and whether it should have any place in a constitutional democracy. Liang sought to draw a link between the fundamental right to freedom of speech and expression, the law of sedition, and the right to dissent. Sedition is the only offence against the freedom of expression which carries a life sentence, said Liang, referring to Section 124A of the Indian Penal Code. He wondered why the lawmakers believed this was so important when even vicious hate speech, punishable under Section 153A, carries a maximum three-year sentence. The sole reason, Liang believes, is the fact that the ghost of Partition, and the consequence of the country breaking up into fragments, haunted India's new lawmakers. So, even if many of them had been jailed and imprisoned for sedition, they decided and agreed to retain the provision, which was essentially a colonial ploy to quell all forms of dissent against the ruling power. Liang also criticised the law's power to 'enforce' affection and loyalty to the government, when the very essence of democracy entails just the opposite. "Why should one be compelled to 'love' the government?," he shouted, amid loud cheers. "How does one reconcile between the principles and the practice of the right to free speech?," Liang questioned. The only way, he said, was to ensure freedom from fear of prosecution (and persecution) before, during, and after delivering a speech, howsoever trenchant and critical it might be. Sadly, in case of sedition, the exact opposite is the case, he said. A person who has the right to hold the government and State's feet to the fire is compelled to constantly look behind his shoulder for police retaliation. Liang minced no words while asserting that a cherished and valuable right had been purloined by hecklers and jingoistic elements in the mainstream media, especially television channel anchors. In a parliamentary debate, Union HRD Minister Smriti Irani, repeatedly kept referring to Rohith Vemula as a 'child'. Rohith, who hailed from a Dalit background was doctoral candidate at Hyderabad Central University in his late 20s, committed suicide last month. In the course of his talk, Liang tore into Irani's statements and her denial of Rohith's social identity. He asserted that there was a "glorious and trailblazing record of 'children' having won major freedom-of -expression battles". For example, he pointed to the United States Supreme Court's 1969 ruling in Tinker versus Des Moines Independent Community School District. The case involved a 13-year-old schoolgirl in Iowa state who, along with some of her schoolmates, wore black armbands to school to protest against the US's attack on Vietnam. When the school authorities hauled them up, the court ruled in their favour, stating that the right to dissent, even if it ruffles the feathers of some die-hard 'nationalists', is an intrinsic part of democracy. Liang also referred to India's Supreme Court 1987 decision in Bejoe Emmanuel versus State of Kerala, in which a three schoolchildren won a major victory for the right to free speech (which includes the right to remain silent). Three Kerala schoolchildren, belonging to a particular Christian denomination (Jehovah's Witnesses) knocked on he doors and won their right to not sing the national anthem. Liang went to considerable lengths to warn against considering that the judiciary would always come to the rescue when free speech is in danger. India's courts, on certain occasions, have been quite regressive, he stated. 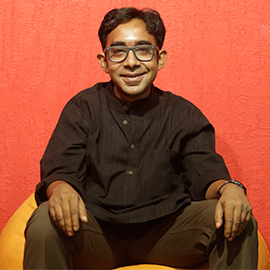 As an example, he pointed to the Bombay High Court's 1994 decision in Joseph Bain D'Souza versus State of Maharashtra. The case involved a retired public servant's challenge to the state government, which was dragging its feet on prosecuting vicious hate speech. Shiv Sena supremo Bal Thackeray was spewing vitriol on Muslims in his edits in 'Saamna', the party mouthpiece. Thackeray's comments were more than sufficient to incite communal violence, especially in a city (Mumbai) which was still reeling from the aftermath of one of the most gruesome communal riots in India. The court could have well taken notice of the prevalent socio-political situation, but it didn't. Instead, it ruled that communally-charged hate speech would be punishable only if directed against 'patriotic' Muslims. If allegedly 'treacherous' Muslims were being vilified, the law would remain silent. After the sedition row broke out at JNU, plenty of people have branded the university's students as 'delusional', among other things. They have also accused the agitating students of being leeches, feeding off taxpayers' money and doing nothing worthwhile. Liang took umbrage to these unsubstantiated charges. He believes that it further chills the freedom of expression and the right to dissent, on which there's already been a heavy State crackdown. He urged the students to not buckle under pressure. "After all, only a relentless pursuit of the 'politics of the impossible' can sustain and save a democracy and its institutions," Liang stated.